On the day that Isabel Ashdown’s third and latest novel launched, London enjoyed the first real heat of the year. For a lot of people at the event, it seemed as if the weather had been specially ordered. There we all were, sweltering away, while celebrating the launch of Summer of ’76, a book set in the summer of record high temperatures and a severe drought that brought with it water rationing and standpipes and heat that made Brits and their gardens wilt. Until that week, I think most people in Britain would have said that it hadn’t been a good year for weather, unless you’re the sort of person who likes every kind of weather on the same day and is fit enough to carry all the accompanying wardrobe changes that might necessitate. All of which leads me to think that there is perhaps some wizardry at work when Isabel Ashdown takes up her keyboard – or pen, if she still writes her first drafts longhand. The release of her novel about the summer of a famous heatwave seems to have heralded in another one, just when Brits were beginning to despair that this summer might turn out to be another washout like last year. I believe it entirely possible that Isabel Ashdown is capable of conjuring up a heatwave. She does just that within the pages of Summer of ’76. Met Office reports at the start of every chapter give us the raw temperatures but its her deft prose that really makes you feel the heat of that long hot summer and how everything and everyone suffered, browned and some others even unravelled under it. I think I drank more (water!) while reading this book than I’ve ever drunk for any other book. And Summer of ’76 made me thirsty in other ways. I found it almost impossible to put the book down once I started it and managed to read it in what was an incredibly busy weekend for me. A lot of that is down to Isabel Ashdown’s storytelling. Her characters don’t feel like characters in a book, they’re more like real people who you live with for the time you’re reading: I especially liked Luke and his family in this story, and thought the relationships between them all were realistic and true. I got a real sense of what life was like for the teenage Luke and his friends on the Isle of Wight during this last summer at home for him before he goes off to the mainland and college. And it was really important that that worked for me because I lived on the Isle of Wight when I was a teenager. I didn’t clean chalets in a holiday camp like Luke does but I did waitress at the local tea gardens and there was a similar camaraderie among all of the youngsters who worked there and went on after work to party at the Ryde Queen, just as Luke does with his friends. The locations ring true and it’s clear that Isabel Ashdown is both fond of the Isle of Wight and has done her research, though she seasons her book lightly with it. I also enjoyed how the secrets in the novel were slowly revealed, like peeling off layers of sweaty clothes or waiting for a patch of sunburn to blister, crack and flake off. I could feel tempers fraying and desperation intensifying as the mercury rose and as Luke got closer to understanding what was going on, not just in his family but also in his wider circle of family and friends. This was an incredibly satisfying read and one that I am happy to recommend, whatever the weather. 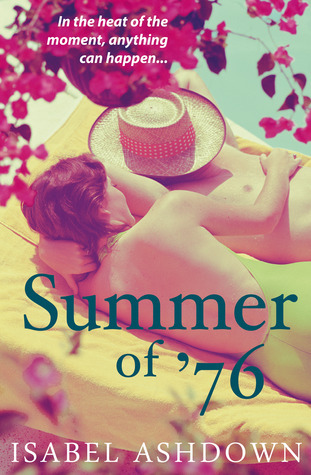 Summer of ’76 is Isabel Ashdown’s third novel published by Myriad Editions. Her previous books being Glasshopper and Hurry Up and Wait. Summer of ’76 is available from all good bookshops and online retailers such as Amazon UK, Amazon US, The Book Depository and Waterstones. You can find out more about Isabel Ashdown from her Author Website or Follow Isabel on Twitter. And be sure to check out Isabel’s fun 1970s Hall of Fame/Shame on her website to celebrate the launch of Summer of ’76.